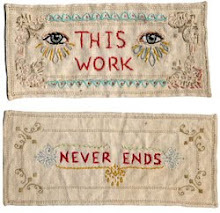 Embroidery as Art: About "This Work Never Ends"
About "This Work Never Ends"
One of my very favorite pieces of yours is "This Work, Never Ends." 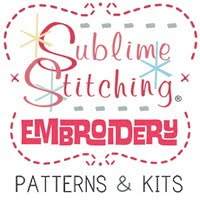 It reminds me of samplers I have inherited from my Great aunt. Can you tell us a little bit about your motivation and inspiration behind that piece? I made that piece for myself. 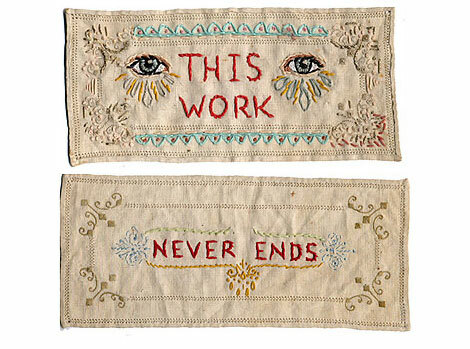 It was two rectangular doilies, and I stitched "this work" on one and "never ends" on the other. They sat for a long time on the back of my armchair where I used to do a lot of embroidering. It was kind of a message with multiple meanings to myself about how work is never done no matter how you try, and also how embroidery lives on forever and grows and changes.